These compact ported monitors from Belgium boast a communicative mid-range and a flattering overall sound. The history of compact monitors goes back to the BBC-designed LS3/5A of the mid-'70s. The LS3/5A, itself derived from a speaker used in one-eighth-scale architectural acoustic modelling, was intended specifically for monitoring in cramped outside-broadcast trucks. It was designed in-house by the BBC, partly because there was no suitable commercially available product — imagine, a world with no small monitor speakers! The LS3/5A was licensed for commercial manufacture, originally by Rogers, and subsequently by a whole string of UK speaker manufacturers — Spendor and Harbeth to name but two. Stirling Broadcast currently hold a license and manufacture the speaker, one that's held in very high regard in hi-fi circles, and it's not unknown for fans to get quite weepy over the LS3/5A. But what, you might ask, has that paragraph of audio history got to do with the subject of this review, the FAR OBS? Well not only is outside broadcast one of the intended applications for the OBS, but it also uses drivers with dimensions almost identical to those of the LS3/5A, and a cabinet that differs only in proportions — it's a little squatter and deeper. Despite the obvious 'active' difference between the LS3/5A and the OBS, there's no ignoring its lineage. The OBS follows the familiar basic constructional pattern of similar active nearfield monitors. 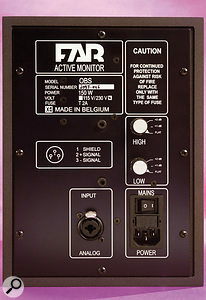 The rear panel incorporates an amplifier module that carries the mains and signal inputs, the latter on combi jack/XLR (jack unbalanced, XLR balanced). 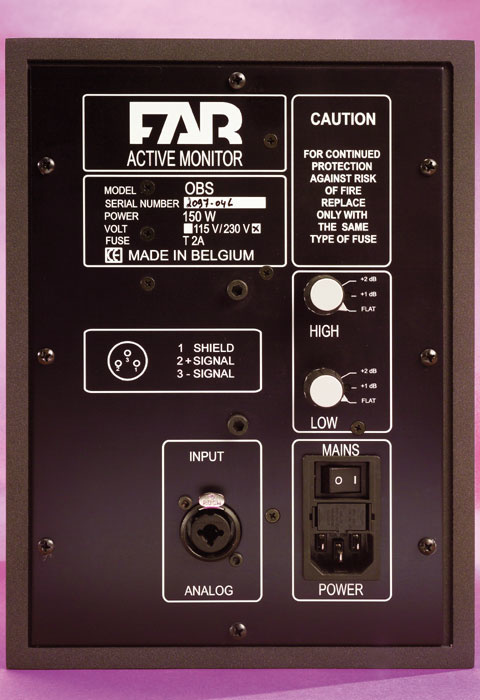 The module here also carries low- and high-frequency equalisation knobs that each offer positions labelled Flat, +1dB, and +2dB. Strangely, the controls offer only gain, no cut, and still more strangely the owner's manual doesn't refer to them at all, so I've no idea at what frequencies they operate. And while I'm on the subject of the manual, it's a pretty humdrum document that's of little use to man or beast. Around the front of the OBS there's a green LED power indicator, an indented gain control (the indents being the only way of matching the level of a stereo pair), and the noisy bits — a 130mm coated-paper-cone bass/mid-range driver and a 25mm textile-dome tweeter. The drivers are mounted on a truncated pseudo-elliptical sub-panel that provides a little relief from the rectangular aesthetic, and may offer some diffusion of edge-diffraction effects. Positioned between the drivers, and either side of the panel, are twin reflex ports. The ports have a modest flare moulded into their exits, but are of a small size that means compression and distortion from turbulence are almost impossible to avoid. The front panel, like the remainder of the OBS, is finished in a dark-grey textured paint — 'functional' is the term that immediately springs to mind. Regular readers will know of my dislike of reflex ports, but with a very small cabinet and bass driver, the need to squeeze a quart into a pint pot in terms of bass extension and power handling means that there is little option. Or is there? 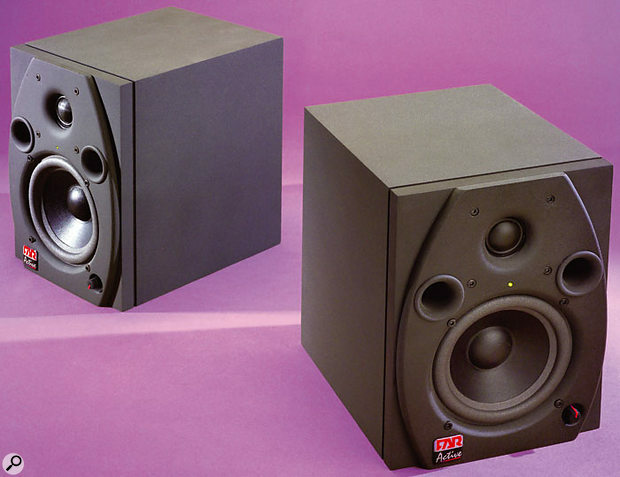 The LS3/5A is a closed-box speaker, and so is the similarly dimensioned ATC monitor, the SMC7. The LS3/5A manages without port loading simply by having no ambitions other than to offer medium-volume, accurately balanced audio between 100Hz and 20kHz. While it was originally designed as a genuine 'monitor', it simply doesn't have the power handling or bass extension to cope in our contemporary wide-bandwidth, high-volume world. It doesn't attempt to reproduce low bass, so doesn't get into difficulties by trying. The ATC, though, is a different kettle of fish. It both has a relatively extended low-frequency bandwidth and goes reasonably loud, without resorting to a ported cabinet. The secret is heavyweight and expensive engineering in the bass/mid-range driver that enables it to handle more power both thermally and mechanically. A port (or two) is unfortunately no substitute for a bigger magnet, thicker top plate, larger-diameter voice coil, and edge-wound voice-coil wire. Ports do extend bandwidth and increase power handling, but at the cost of distortion, compression, and degraded transient response. The OBS specifications reveal that it employs first-order filters to integrate the drivers. This seems an odd decision to me, and one which has repercussions. First-order filters offer a clean transient response, a slow rate of change of phase with frequency, and, in theory, zero phase error at the crossover frequency. They also, in passive speakers, involve the minimum of distortion and coloration-inducing components between amplifier and drivers. Unfortunately, however, the slope of first-order filters is so shallow (6dB/octave) that they provide precious little attenuation of any out-of-band driver resonances and result in a very wide band where the outputs of the two drivers overlap. One of the great advantages of active speakers is that higher-order crossover filters can be used, properly attenuating the drivers outside their optimum operating band, without the necessity to introduce a multitude of lossy capacitors, resistors, and inductors between the drivers and the amplifier. In using active first-order filters, FAR have consciously chosen not to take advantage of this. Proponents of first-order filters, presumably including FAR, would perhaps argue that the good transient performance and 'perfect' phase response are the most significant characteristics. The trouble with this point of view, however, is that the 'perfect' phase response of a first-order crossover network only comes fully to fruition if the drivers are coincident in space (dual-concentric is the closest we can get). With the non-coincident drivers of the vast majority of speakers, while perfect phase integration will occur at specific points in space, at other points the overlap output of the two drivers will 'rotate' in and out of phase, resulting in wide-band off-axis frequency-response errors. Of course the same basic phenomenon occurs with any filter topology and non-coincident drivers, but the wide overlap inherent in shallow-filter slopes makes matters worse. Unfortunately, a pretty good demonstration of the resulting effect can be heard with the OBS — its perceived high/mid-range tonal balance varies significantly above and below axis. If ever there were a monitor not to use laid on its side, it's the OBS. So why, you might ask, have FAR decided to go with first-order filters? Well, primarily, I suspect it's because there is empirical evidence that low-order filters can endow speakers with a subjective sense of clarity and naturalness, and while I'm not convinced by aspects of the OBS monitor's engineering, they do have an engaging and transparently musical sound about them when heard on-axis. Perhaps this sound flatters to deceive — after all, 'flattering' is not the first characteristic you'd choose for a professional monitoring tool — but, on the other hand, the OBS is a highly communicative speaker. Without straying too far into hi-fi review language, if there's an emotional, human element to be found in a piece of music, I'd bet on the OBS to reveal it. And funnily enough, that's exactly the kind of thing traditionally said about the LS3/5A. Worth a listen. While it's Idiosyncratic, and not the most analytical of monitors, you could fall for the communicative mid-range. £600 per pair including VAT. Digital Village +44 (0)20 8440 3440.